Did you know that the speed at which you eat can effect your weight, as well as your health?! We live in a fast-paced world. We are busy, in a rush & on the go all the time. And this applies to our eating too. Many of us scoff down meals within seconds, basically inhaling our food without even chewing it. (Hands up who has done this before. Haha I know I’m guilty of it). Think back to the last meal you had. How long did you take to eat it? If you devoured it within a few minutes, or even seconds, then you might want to work on slowing it down. Why? Because the speed at which you eat your food can effect your weight and your health! 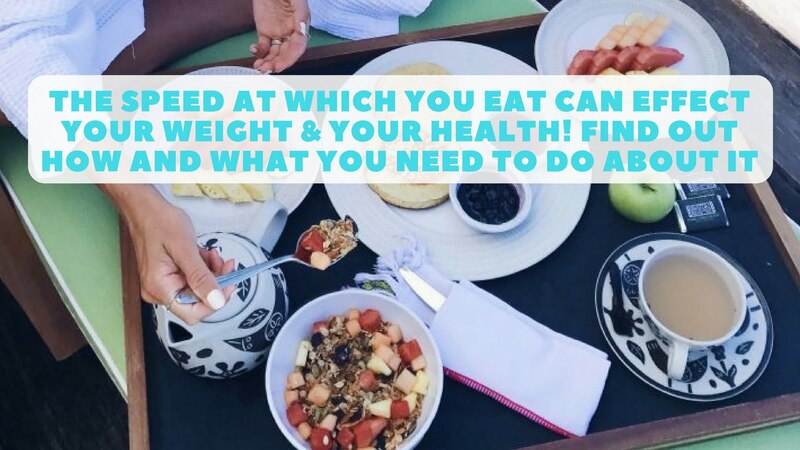 Eating too quickly can contribute to weight gain because it causes you to over eat & consume more food than your body actually needs. Your brain requires about 20-30minutes to register that it’s actually full, so if you eat quicker than this, you’re not allowing your body enough time to feel satiated, which often leads to seconds & eating more than you should. Fast eating also effects your health. Physical digestion begins in the mouth with the chewing of food. If you don’t chew your food properly, then your body can’t digest and absorb the nutrients effectively, so you will be missing out on the vital nutrition that your body needs to keep healthy. 1. Allow yourself to eat – slow your eating down & take at least 20-30minutes to finish your meal. It may sound like a long time but your body needs this long to register that it’s full. Look at the clock and time yourself if you need to. 2. Chew each mouthful well – aim to chew each mouthful of food 10 to 15 times. This will not only slow your eating down but it will allow for improved digestion & absorption of nutrients. 3. Put your knife & fork down between each mouthful – this is a simple, yet easy way to slow your eating. 4. Concentrate on your meal & enjoy it – this means sitting at the table with no TV, no phone, no work. Just you and your meal. Focus on your food and really enjoy it. Smell it; taste the flavours; feel the texture. You’ll be surprised how much you actually love food when you concentrate on what you’re eating. So next time you have something to eat, try these easy tips and let me know what happens! Awesome! Thanks for the tips! ? Thanks Kathryn! So happy you enjoyed the article!